If you have read some of my other reviews, you’ve probably noticed that I often recommend the fully automatic AT-LP60 turntable because it’s one of the best record players you can get for the price. 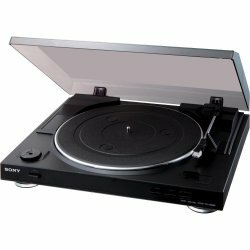 This time, I present to you a great alternative, the Sony PSLX300USB turntable. Both record players have pretty much the same features. Everybody knows that Sony makes good quality products and this one is no exception. However, it’s always a good idea to take a closer look at a product before you buy it to make sure it meets your particular needs. In this review, you’ll find everything you need to know about the Sony USB turntable, to help you decide if this product is right for you. The PSLX300USB record player is a fully automatic turntable with USB connection. The player itself is very easy to operate. Unfortunately, many people find the software difficult to use and the recording process time consuming. Specially if you don’t get along with technology. The software is an advanced audio editing tool that has many features that you most likely don’t need. This makes the software complicated for the average user. The software is great, but it requires some time to learn it. You should still consider this product even if you don’t like the software that comes with it because there are other programs out there that you can use. I recommend the PSLX300USB turntable to anybody looking for an easy to use and easy to setup record player with decent sound quality. You just press a button and enjoy your music. This is a good choice for people just getting into vinyl or for someone like me wanting to revive their old vinyl collection. If you don’t like messing around with complicated setups and adjustment features, this product may be right for you. This is a good product for people that you just want to listen to their 33&frac13; and 45 records without spending a fortune. In short, this is an affordable, easy to use record player with good sound quality that will treat your records nicely. If you are looking for a plug-and-play, self-contained player with built in speakers, then you’ll be very frustrated when you open the package and find out that your new phonograph needs external speakers to work. If that’s you read my article on record players with built in speakers. Forget about this turntable if you want complete control over your turntable. This turntable doesn’t have advanced adjustment features like counterweight or anti-skate. This product is not a high-end turntable. Audiophiles may not satisfy their high-fidelity sound appetite with this Sony record player, but I’m sure that the average listener will be pleased with the sound quality. Now, if you are looking into buying this turntable for transferring your music to your computer, think twice. If you are good with technology, go for it, because with the recording software provided you’ll get good quality recordings. If you are not a techy, then expect to spend some time learning the software. Be patient, though, it’s worth it. On the other hand, if you are looking for a fast and easy way to digitize your vinyl collection, this product may disappoint you. You may want to find other options that don’t involve using a computer. Or take a look at other audio recording software you may use. 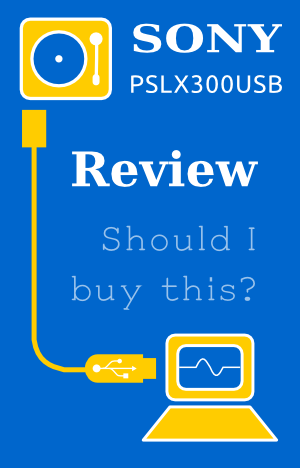 This was a long introduction, but now you have a general idea about the PSLX300USB. If you think this Sony turntable is right for you, keep reading this review. Otherwise, take a look at my other reviews, you may find what you’re looking for. This turntable has a magnetic cartridge that is fixed to the tonearm. This is one of the few turntables in this price range that have a magnetic cartridge. Most low end turntables have a ceramic cartridge instead. The benefit is that a magnetic cartridge will give you a better quality sound and your records are less likely to get damaged or worn out. You won’t be able to upgrade to a better cartridge because it is fixed to the tonearm. This means that there is not much room for improvements to your turntable. You can only replace the needle or stylus for a sightly better one. In the future, if you want to improve the performance of your player, your only option would be to buy a better record player. The stylus has a 0.6 Mil highly polished conical diamond mounted on a thin-wall aluminum alloy cantilever. According to the user’s guide, the life expectancy of the stylus tip is about 500 hours. Many consumers have complained that they were not able to find a replacement stylus. The replacement needle model is N-6516 (Sony part number 988511775) that you can get from LP Gear. If you can’t find the original stylus from Sony, you can use Audio Technica ATN3600L. The ATN3600L is actually the one included with the AT-LP60USB. Some consumers have claimed that the Audio Technica stylus sounds better than the original. You can buy replacement stylus for your Sony PSLX300USB from Audio Technica, LP Gear, Amazon or eBay . Most of the time I find that eBay has the lowest prices. Our featured turntable has a straight-shaped tonearm with an effective length of 195 mm. This model is fully automatic, meaning that you press the start button and the needle is automatically positioned at the beginning of the record. When the needle gets to the end of the record the turntable stops spinning and the arm automatically returns to its rest. The operation couldn’t be easier. Make sure you select the right size of your record so that the turntable knows exactly where to drop the needle. The available sizes are 7′ and 12′ which are standard sizes for 45 and 33&frac13; respectively. In the unlikely event that you have a record with a different size, you’ll have to position the needle manually, you wont be able to use the automatic start feature. You can manually position the needle to select any track by using the UP/DOWN button. This is like the cueing lever present on other record players. This button is also use to pause playing. This product doesn’t feature an automatic changer, which is good. Turntables with automatic changer may damage your records. This means that you have to manually change or flip your albums. This may be obvious to you as it is to me, but I’m including this information because I’ve seen this being asked many times. The Sony PSLX300USB doesn’t have advanced adjustment features like counterweight or anti-skate. So, if your turntable skips, there is not much you can do about it, other than to make sure it sits on a leveled surface. But don’t worry, I have seen very few complains about this player skipping. I have seen some complains about the automatic return feature malfunctioning after some time of use. For example, the tonearm may return to its rest right after it starts playing. This may happen when the mechanism gets out of sync. You may try turning the platter several times counter clock wise to fix it. If it doesn’t work, you may have a faulty unit. My recommendation is to call the manufacturer and get it fixed or replaced if it is still under warranty. This is a belt dirve turntable. It has a DC motor that operates at AC 120 V, 60 Hz . The user guide suggest that you may find another model that operates at 240 V in other countries, check locally to see if something is available. This particular model was made for the US market and only operates at AC 120 V, 60 HZ. In the past, I have suggested to my readers to use power transformer, but I know some people have tried that without success. The power transformer doesn’t change power frequency, so your turntable may operate at a different speed. The result may be that you hear your songs faster or slower that they should. This product supports 33&frac13; and 45 rmp playback speeds. Wow and flutter refer to pitch variations that result from speed irregularities. According to the specifications, the wow and flutter is less than 25%. This is acceptable for a record player in this price range. I doubt that the average listener would notice any pitch variations with this turntable. Some times pitch variations are present in warped records that have the center hole misplaced. You may verify this by playing different records on the same player or by playing the same album on a better record player. Make sure you carefuly read and follow the installation instructions. If the belt is not placed the right way, it may cause speed inconsistencies. If you ever need to replace the belt you can buy it from LP Gear. The first thing I want to say, is that this turntable won’t produce any sounds by itself. It needs to be hooked up to either a set of powered speakers, an amplifier or an audio system. Again, this may be obvious to people who, like me, grew up during the vinyl era. I mention it because I’ve read reviews of people that returned their item because it wasn’t clear in the description that the turntable needed speakers to work. Having said that, there are many possible setups suitable for the Sony PSLX300USB record player. In fact, the possibilities are endless. Here, I’ll explain the main outputs and some possible setups for this turntable. The turntable comes with an RCA cable hard wired to the unit and a USB port. The USB cable is included. Note that the RCA cable is very short, you may have to buy extension cables if you are planing to position your speakers away from the turntable. Phono cartridges produce a very weak electric signal referred to as PHONO level signal. This type of signal needs to be amplified to a LINE level. This is why a pre-amplifier is needed. Fortunately, this phonograph has a built-in pre-amplifier. On the back of the turntable there is a PHONO/LINE switch that lets you specify the type of output that you’re going to connect the player to. Many modern receivers and powered speakers don’t have a PHONO input. Thus the built in pre-amplifier comes in very handy. But if you want to bypass the pre-amplifier, you can set the switch to PHONO. This allows you to connect your turntable to a better pre-amplifier to improve sound quality. 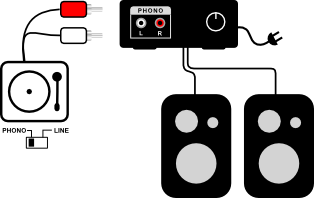 PHONO -Through the RCA cables by setting the PHONO/LINE switch to PHONO. 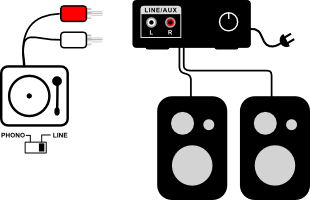 LINE – Through the RCA cables by setting the PHONO/LINE switch to LINE. DIGITAL – Through the USB cable provided. The USB port lets you connect the turntable to your computer. It uses the generic USB Audio Codec compatible with Mac, Windows and Linux, so there is no need to install special drivers. Your PC will automatically download the necessary drivers. The sound coming out of the USB output is not too loud, just like the AT-LP60USB. Contrary to the AT-LP60, the Sony PSLX300USB doesn’t include RCA to 3.5 mm jack adapters. You may need to buy them if your speakers or receiver only has 3.5 mm jack auxiliary inputs. One important thing to consider is that this turntable, as many others, does not have a volume control. This is normal for the majority of component turntables. You’ll have to control the volume from the receiver or speakers connected to it. Neither does it have a headphone jack. This turntable is very similar to the Audio Technica AT-LP60 USB. It has the same outputs. To avoid repeating the same information here, you can read the Connections section of my Audio Technica AT-LP60USB review. The same setups can be used on this turntable. Here are the most common diagrams in case you are in a hurry. The PSLX300USB record player comes with Sound Forge Audio Studio which is a sound editing an recording tool. This program has many features, among them, the Enhanced Vinyl Recording and Restoration tool that let you to digitize your vinyl music and remove clicks, pops and other noises. By itself, the software has a value of about $60 at the time of writing this review. The software automatically splits the audio tracks. Some times, the software is not very accurate at splitting tracks, but you can easily fix the start and end points inside the program or add song breaks if they were not detected. I personally think that this is a wonderful sound editing tool. In my opinion digitizing you vinyl records is very easy if you use the Vinyl Recording and Restoration wizard. I use recording software often, so I can’t give you an objective opinion. However, many users have found this software difficult to use. This is probably because the software has many features that you may not need. If you haven’t been exposed to this type of software before or if you are not good with computers, expect to spend some time learning the software. I really encourage you to try it out. Here is a short video to give you an idea of the Vinyl Recording and Restoration tool. Don’t worry if you don’t like the software, there are many alternatives for recording vinyl records. Some of those tools are free. 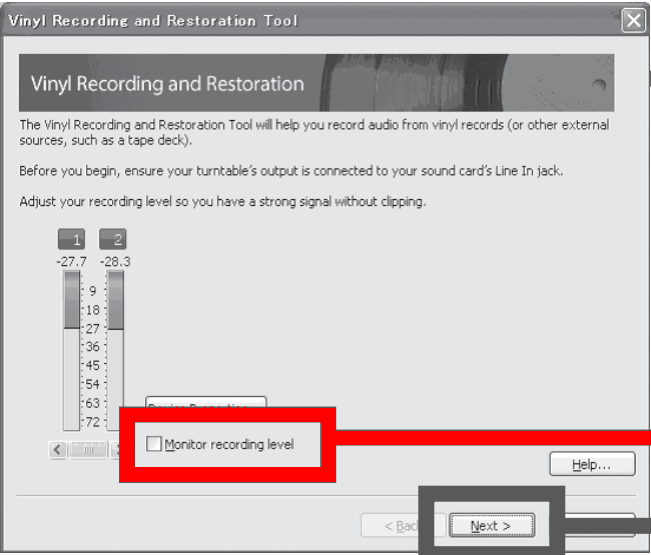 I compiled a small list of recording software tools that you can use to digitize your vinyl records. You can find the list on my Audio Technica LP60USB turntable review. Be aware that this software doesn’t work with Mac OSX. But that shouldn’t discourage you to buy this turntable. Remember that you can use other tools like GarageBand or Audacity. Just remember to select USB Audio Codec on Device Properties. 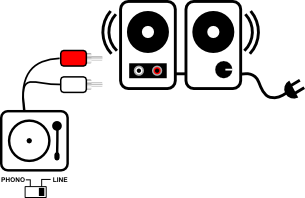 You can also monitor your recording by connecting a pair of powered speakers to your record player. Just a quick tip: you can improve the sound quality of your turntable by using a better pre-amplifier than the built-in one. Just remember to set the pre-amp selector to PHONO. The whole body of the turntable is made of plastic and it only comes in black. The plastic contruction makes it look cheap and it feels flimsy. It has a conservative look. Some users wished it had a cooler look and design. It has a clear removable dustcover that can be safely closed during playback. This turntable has very good consumer reviews and ratings. Many bad ratings are related to the software. Many tech savvy users, however, have been very pleased with the quality of their recordings. I personally wouldn’t rate this product low because of the software, in the end, we want a good player regardless of the software. But that is just my opinion. Consumers that have owned other low end USB record players consider this one a good upgrade. Users appreciate the ease of use and the easy setup. Many owners have had this player for more than a year without any problems. Many times this product has exceeded consumer expectations. Most users have been satisfied with the sound quality of this player. Now the bad things 🙁 . The number one complain about this product is the recording software. We have already discussed this, but here is the short version. According to some users, the software is complicated and lacks documentation. It is “impossible” to monitor during recording. The software doesn’t work on a Mac and the split track feature doesn’t work at times. The second complain that I’ve often seen is the arm return malfunctioning after some time of use. Try turning the platter several times counter-clock wise to see if it solves the problem, otherwise, call Sony to get it fixed or replaced. Few people have complained about skipping problems. I would advice everybody to always keep their records and stylus clean to reduce skipping and noises. Also, make sure your record player is leveled and keep your speakers away from the turntable. Other complains include short RCA cable, few broken or defective units and inaccurate speed. If your turntable happens to play faster or slower than it should, you can adjust the motor speed by turning the trimmers located on the bottom of the unit with a small screw driver. The one thing that really concerns me is the incredible amount of comments about the terrible customer service provided by Sony. According to many customers, its hard to contact them and it takes them for ever to get back to you and their phone lines are always busy. You can download the manuals here. This fully automatic turntable turntable is a great alternative to the AT-LP60USB and it has good ratings. They both have the same features and both are good quality products. The Sony player comes with a commercial recording software but is a slightly more expensive than the Audio Technica. On the other hand, the Audio Technica comes in two colors and it has a cooler design. They are both, good options to digitize your vinyl collection with decent sound quality. I still prefer the Audio Technica because of its price, nicer look, color options and their great customer service. Hi there – you recommend both the Audio Technica ATN3600 or the ATN3600L stylus as a replacement. Can you tell me the difference between the two and which would be the better choice for this turntable? The ATN3600L is the right one. I’ll update the article to reflect the right information. The Audio Technica ATN91 stylus is not suitable for this player. It has a maximum tracking weight of 2.5 grams. These generic Chinese turntables have preset tracking weight anywhere between 3.5 and 5 grams. The ATN3600 is the one to use. Thanks Peter for your comment. I’ll make sure to change the post to reflect the right information. You are right. It could be used only if the turntable had a counterweight to adjust the tracking force. It is not the case with this turntable. Thus, only the ATN3600 can be used. I appreciate you taking the time to point that out.